Dun & Bradstreet (D&B), the world’s leading provider of global business information, knowledge and insight, today announced and presented the ‘Dun & Bradstreet – Bharathi Cement Corporate Awards 2012’ in Mumbai. The occasion also marked the launch of the thirteenth edition of Dun & Bradstreet India’s premium publication, ‘India’s Top 500 Companies 2012’ by Mr. Jayant Kumar Banthia, Chief Secretary, Government of Maharashtra, who graced the occasion as a key note speaker, while Mr. Ravinder Reddy, Director Marketing, Bharathi Cement, Dr. Alok Bharadwaj,Executive Vice President, Canon India and Mr. Sudhakar Reddy Chirra, Founder & CEO, Abhibus.com delivered the address at the event. The ‘Dun & Bradstreet – Bharathi Cement Corporate Awards 2012’ seeks to recognise and felicitate corporate India’s leading companies from various sectors. 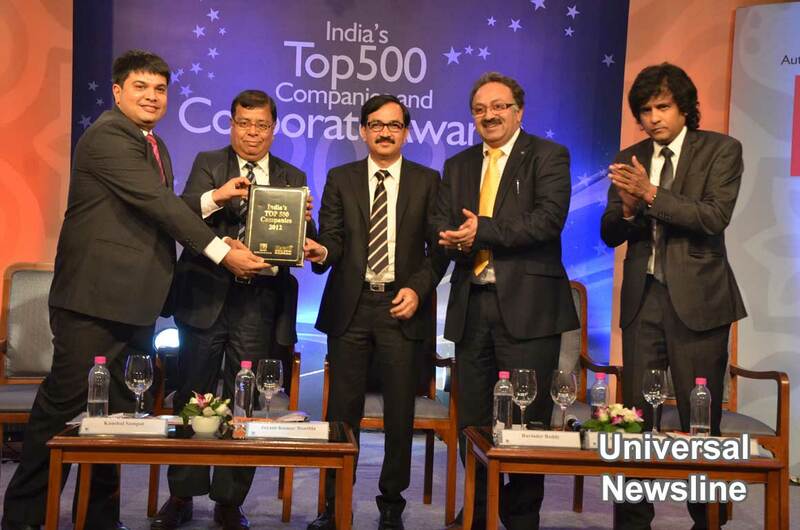 The Awards event is closely tied to the publication, India’s Top 500 Companies 2012. Therefore, the base universe of the companies considered for the Dun & Bradstreet Corporate Awards 2012 comprised of the top 500 companies of India as covered under the publication. The awards methodology was applied to this list of top 500 companies, duly classified in their respective sectors. D&B India developed a proprietary financial model for identifying the top companies in each sector. The model is based on the premise of recognising the twin virtues of size and growth of the companies while awarding them. The analyst team identified pertinent financial parameters to fulfill this premise and assigned weights to them. Winners were chosen on the basis of a composite score of these weighted parameters. The eight parameters considered for ranking the companies include - total income, net profit, net worth, net profit margin, return on net worth, average market capitalisation for FY12, growth in total income and growth in net profit. Over the past decade, Dun & Bradstreet India (D&B India) has endeavoured to provide top Indian companies a global platform through its acclaimed publication, ‘India’s Top 500 Companies’. The publication profiles India’s most well - respected and high performing companies on the basis of various financial parameters. The 2012 edition is the 13th edition of the publication. The criteria for ranking used in the D&B’s publication ‘India’s Top 500 Companies 2012’ are total income, net profit and net worth. It includes both private sector companies as well as public sector enterprises (PSEs) that are listed on stock exchanges. The companies were short listed on the basis of their market capitalisation on the Bombay Stock Exchange and the National Stock Exchange, India’s two main stock exchanges. · The movements in the capital market showed contrasting trends during FY12 wherein the Sensex declined during the first half of the year but showed an improvement during the latter half of the year. The average market capitalization of the Top 500 companies during FY12 stood at ` 55,597.1 bn, witnessing a 7% decline compared to the previous year. · Top line performance of the Top 500 Companies in FY12 grew by 24.6% to 43,490.19 bn, and was equivalent to 48.5% of the GDP at current market price during the year. · Healthy growth in top line could not be translated into profitability on the back of mounting expenses. On an aggregate basis, the net profit of Top 500 Companies grew by a modest 7.3%. · On an aggregate basis, overall expenses (excluding taxes) of Top 500 Companies stood at 39,062.7 bn, registering 27% growth over FY11. Raw material expenses increased, largely driven by 40% growth in import bills of raw material particularly resources such as coal and crude oil. · The challenging environment was reflected in the number of loss-making companies which increased substantially from nine companies in FY11 to 39 companies in FY12. · Tight domestic liquidity conditions coupled with declining profitability made Corporate India adopt a conservative approach towards dividend payout. Equity dividend payouts of the Top 500 Companies grew by a moderate 10.9%, taking the overall dividend payout ratio from 23.7% in FY11 to 26.2% in FY12. Following previous year’s trend, banks, software and oil exploration companies continued to lead with the largest share in dividend payouts. · Public sector companies outperformed private companies in both income and profit growth. Income of public sector companies grew by 29.4% y-o-y in FY12 as compared to 17.2% growth of private companies. Profit of private companies declined by 2.4% whereas that of public sector companies grew by 17.3% in FY12 over the previous year. · The overall demand scenario during the first three quarters of FY13 largely remained bleak with the overall top line growth of the Top 500 Companies moderating to 11.3% compared to the corresponding period of the previous year. However, they managed to report an improvement in profit growth, reporting a growth of 5.6% during the first three quarters of FY13 compared to de-growth of 9.1% for the corresponding period of the previous year.